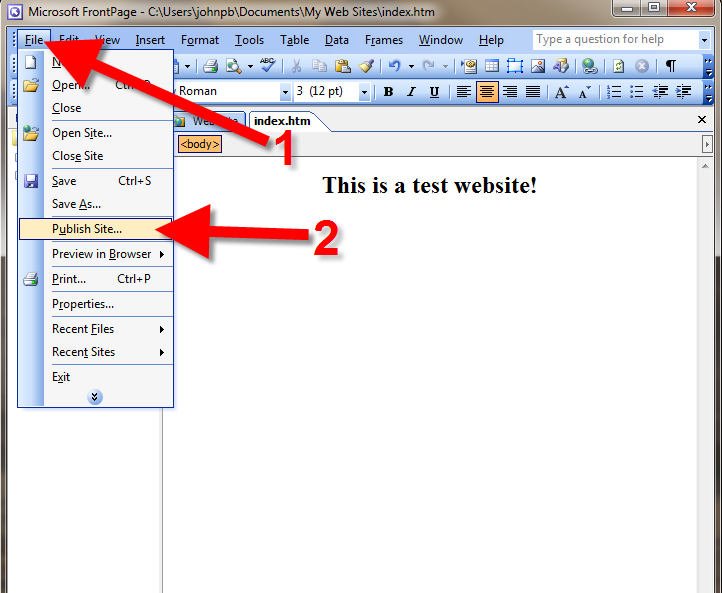 In this tutorial we will show you how to publish a Frontpage website using FTP. This will allow you to continue publishing your website after Frontpage Extensions have been disabled on the server. Microsoft stopped supporting Frontpage in 2006, and we have done our best to allow it to still be used with our servers. At this time Frontpage extensions can open a server up to certain vulnerabilities, which helped us decide to discontinue its use with our hosting environment. For more information, please read our full guide "Death of Frontpage Extensions." You will need to know your FTP hostname, username, and password to complete this tutorial. If you do not know them, I recommend reading our FTP Getting Started Guide. 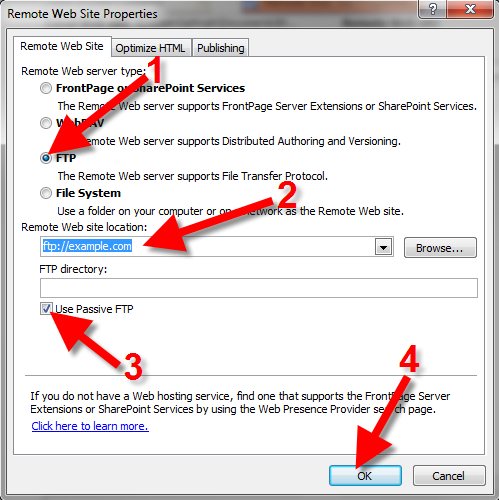 Choose FTP, then enter your FTP hostname in the Remote Web site location field. (In my tests I entered: ftp://example.com). Click the Use Passive FTP option, then the OK button. A Name and Password Required box will pop up. Enter your FTP username in the Name field. 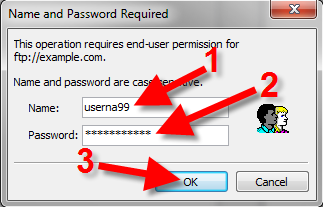 Then put your FTP password in the Password field, and click the OK button. You will then see your Local and Remote web site files listed. 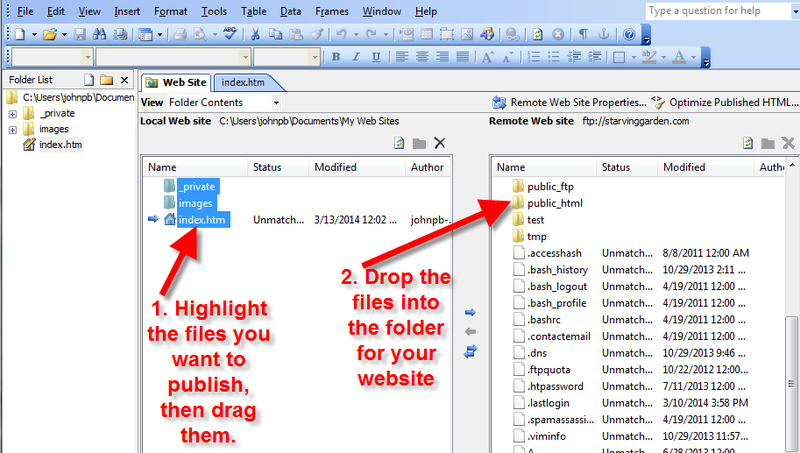 Highlight the local files you want to publish, then drag and drop them into the remote folder for your website. If you are not sure where to drop the files, I recommend reading our guide on where to save your files". Your site will then be uploaded. It is finished when you see your website files on the right side of the window, in the remote Web Site listing. Test your website at this time; if you don't see the changes refresh the page, or clear your browser's cache. Congratulations, now you know how to publish your Frontpage website using FTP! I have a frontpage website that I still like a lot but I have to make it mobile friendly to increase my ratings on Google. Do you have any suggestions? You will need to re-create the page using responsive design. If you're not familiar with how to do this, then you will need to consult with an experienced web site developer/designer. InMotion Hosting also provides Web Design Services that you may want to employ. Responsive web design allows you have one set of code that will work on computer screens or mobile devices. I need to know how to update hyperlinks in Frontpage 2003 using files I have transferred to Filezilla. I am trying to update hyperlinked documents in my web page. Thank you for contacting us. I found a post online via search where they offer a possible solution on How do I open an existing website in frontpage 2003? Trying to FTP publish via Frontpage and getting error message: 425 Could not open data connection to port 61187: Connection timed out. Unable to update via basic FTP (not going through Frontpage) - unable to connect via FTP as well. I'm sorry that you're having problems with using FTP. The issue that you reported may be related to the port you're trying to use for FTP. By default, FTP uses port 21. Additionally, if your network security is blocking FTP, then it will not connect. You will need to check as we have no way to correct that from our hosting servers. Make sure that you're using the cPanel credentials when logging into the FTP for your account. I've been transfering, via FTP, webfiles created in Frontpage for years. I've never used the "publish site" function in FP either. Now I'm looking for a new hosting service and most no longer allow for FP ext. Will this be a problem with my webpages displaying properly? Or are the FP ext only necessary for the "publish site" option? The frontpage extensions are necessary for certain frontpage additions you would put on your website. You are correct that most host have removed this feature. I am SO confused.......If "frontpage extensions are necessary for certain frontpage additions" how can ftp display it exactly the same as stated in the above posts? WHAT will NOT display as it should? Please explain!!! Certain files that use the frontpage extensions exclusively will not be support. However, conventional HTML files will be fully supported. Thanks Scott. Would you happen to know if the forms I created in FrontPage will work if I use FTP? Thank you for your question. Using FTP will not affect your forms, as FTP is just a means of transferring/uploading files. If I use FTP to publish my FrontPage website, what FrontPage functionality do I lose? Will my Forms still work? FTP is simply a protocol to allow you to upload files as is to the server. No code will be changed during the process. The example you gave shows that the spreadsheet is displayed using an iframe while the actual spreadsheet is from somewhere else. You should have no issues at all. Within the Publish Web dialog box, the Options button is greyed out. I am trying to FTP from FrontPage. If the Options link is grayed out, there must be something in the FrontPage causing that. If that is the case and you cannot figure it out, then you may want to use an FTP program like FileZilla to get your files up to the server. Thanks for the help with publishing with FTP. Problem: click on "publish web" and the http box automatically pulls up. Don't see anywhere to pull up FTP option (FP 2002). Within the Publish Web dialog box, simply click on Options and you will be presented with FTP settings. must download my sites first. please provide tutorial on downloading likw what is host: info needed in filezilla and port info? Thank you for your question. You will just use your standard FTP settings, which you can view in your cPanel at any time. Also, here is our helpful guide on Configuring your website in FileZilla.